LAS VEGAS (AP) - O.J. Simpson was arrested Sunday, three days after police named him a suspect in an alleged armed robbery of collectors involving the former football great's sports memorabilia, authorities said. Simpson was arrested shortly after 11 a.m., Capt. James Dillon said. Police were still determining charges. Several police officers were seen entering the hotel where Simpson is staying. A security guard said police took Simpson out a side door shortly after they arrived. At least one other person has been arrested and police said Sunday that as many as six people could be arrested in connection with the alleged armed robbery that occurred in a room inside the Palace Station casino-hotel on Thursday. 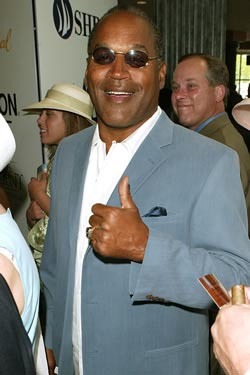 The Heisman Trophy winner, ex-NFL star and actor lives near Miami and has been a tabloid staple since his ex-wife and Goldman were killed in 1994. Simpson was acquitted of murder charges, but a jury later held him liable for the killings in a wrongful death lawsuit. Besides the two firearms, police said they seized other evidence during early morning searches of two residences, Nichols said. Simpson said auction house owner Tom Riccio called him several weeks ago to say some collectors were selling some of his items. Riccio set up a meeting with collectors under the guise that he had a private collector interested in buying Simpson's items. Simpson said he was accompanied by several men he met at a wedding cocktail party, and they took the collectibles.